Popular antipasto ingredients are layered onto a round Italian bread loaf spread with minced garlic and mayo to make these tasty appetizer sandwich wedges. Cut bread into 3 lengthwise slices. Hollow out top, leaving 3/4-inch-thick shell. Discard removed bread or reserve for another use. Combine next 4 ingredients; spoon into inverted bread top. Cover with middle bread slice; top with cheese and meat. Spread combined mayo and garlic onto cut side of remaining bread slice; place, mayo side down, over inverted sandwich. Wrap sandwich. Refrigerate 1 hour. Cut into wedges to serve. Substitute 6 slices OSCAR MAYER Hard Salami for the turkey. 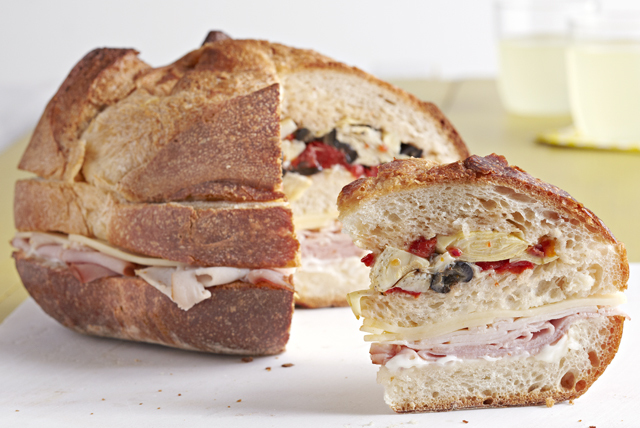 This hearty sandwich can be refrigerated up to 2 days before serving. Pre-packaged sliced meat must be refrigerated and used by the recommended "use-by" date. Once opened, the meat must be used within 5 days.